You may look at your small home and think – am I going to find a buyer? But don’t count your small house out just yet! There are many great ways to position your small house in the marketplace. All it takes is looking at your home’s features from a different point of view. Check out our best tips for selling your small home. We get that a small home isn’t for everybody. But it’s certainly for somebody. Your job is to figure out what buyers may be in the market for a smaller home. These could include first-time homebuyers who are on a budget, retirees who are ready to downsize, or those who want a more eco-friendly home. Once you’ve discovered the type of buyer that would be attracted to your home, you can make smarter decisions about how you market it. Lower costs – Who wants to spend more money on utilities and taxes? With a small house, you get big savings on heating, cooling and electricity. And if the house is on a small lot, you’ll also save on property taxes. Easier to maintain – Some people don’t want to spend much time on maintenance and repair, and a small home offers that possibility. With a small home, you’ll spend less time mowing the lawn, less time cleaning, and less time making fixes. More eco-friendly – Although open-concept homes with vaulted ceilings and chef’s kitchens are popular they aren’t always eco-friendly. Smaller houses don’t require as much energy to heat and cool, and can be made even greener with energy-efficient upgrades. Great location – Your home may be small, but is it in a great neighborhood? That’s a huge selling point. Location is one of the most important features of a home, and if yours is in a desirable neighborhood, make sure buyers know it. If you’re in a great school district or close to public transportation and shopping, tout it. A key part of selling a small home is staging it properly. The first thing you must do before you begin showing the house is to declutter. It is essential that you remove items that aren’t needed, bulky furniture and anything else that is eating up space. Consider painting the entire interior of the house one neutral color, to make it feel more open and cohesive. Take interior doors off their hinges, such as those that separate a dining room and kitchen. Remove heavy curtains and replace them with something that feels airy and lets in the light. While you’re at it, move the curtain rods as high as you can to make the ceiling feel higher. Arrange the furniture for maximum ease of moment from one area to another. Opt for tables with glass tops, couches with legs and mirrors that reflect light and make the space feel bigger. Replace low-wattage light bulbs with the highest wattage rated for that lamp, and keep the lights on during a showing. If you’re worried about selling your small home, don’t! By understanding your buyers’ needs and looking at your home through a new lens, you can position your house for a quick sale! 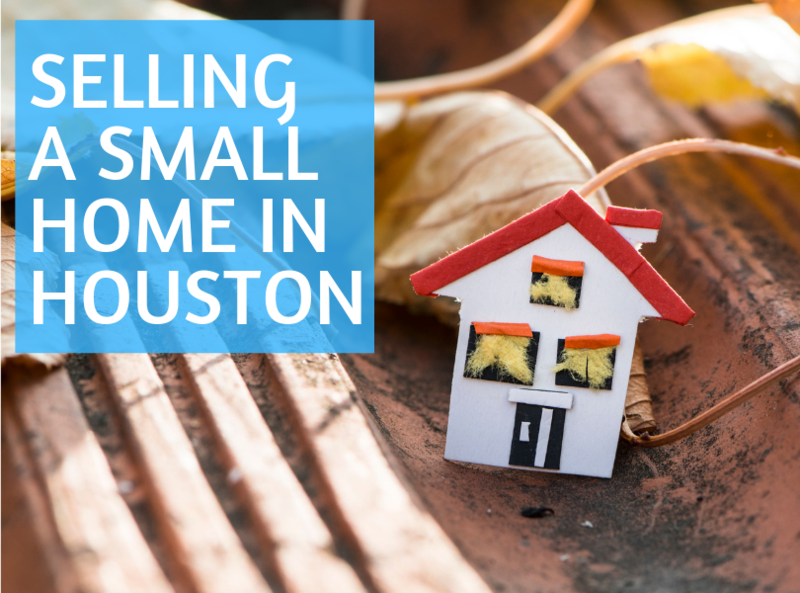 If you are interested in speaking with an agent today so you can begin to prioritize your steps to selling, feel free to call us at 713-869-5700 or click here and fill out the form and we’ll reach out to you.